A full race 750 Commando engine in a 1959 wideline featherbed frame with a genuine Norton Manx close ratio gearbox. A long story history of the bike that I have known for many years is available so I will attempt to condense it all. We have the official dating certificate for the engine, frame and gearbox from the Norton Owners Club in Great Britain. Also the official shipping from the UK and USA customs clearance. 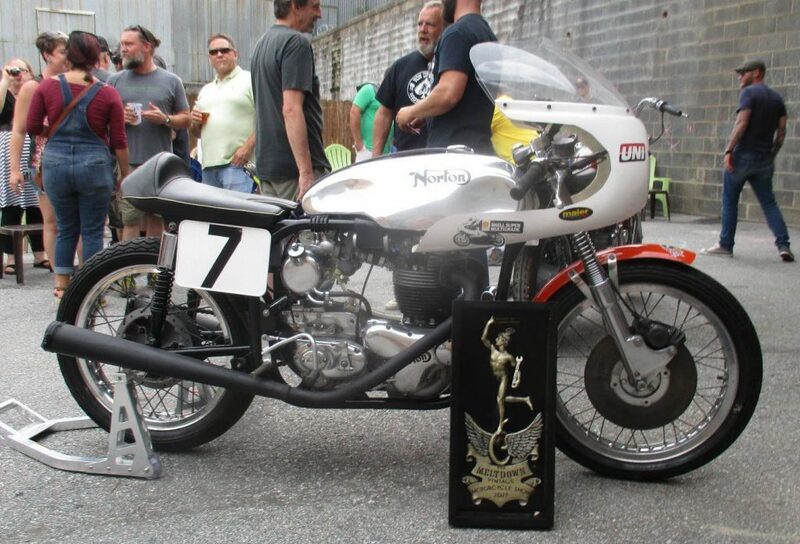 I have a you tube video of the Norton fired up. It seems that Ebay will not allow me to put the link on here. Contact me and I can send you the link. You could try this youtube link. MaS-5XOFdgw Also view the photos as the bike was being built up. The bike was built a by a long time friend back in England. He raced it for a while with a 600cc Norton 99 engine then bought a very low mileage 750 Commando road bike from his friend that was involved in an accident. The engine was taken apart and we have all receipts to show the following modifications. Crankshaft lightened and balanced, Norvil race camshaft, race H.C. pistons, larger inlet valves and a ported cylinder head, valves, springs and new guides. Larger carbs to suit the cylinder head and competition inlet manifolds. A lot of the work was done at the then Norton Thruxton factory as the receipts show. Norvil forks with top and bottom aluminum triple trees and outer springs were fitted. The front rotor is a large 11.5 inch Mick Hemmings one, and we have just fitted a new master cylinder kit. We have many more receipts for other items from numerous dealers including Paul Dunstall that Norton enthusiasts will know. The frame has recently been powder coated classic black of course. The nice aluminum gas tank is a 3 UK gallon short circuit one. Back tracking: After trying the bike out just once and he was pleased with it he carefully did the correct things for long time storage as he retired from racing to further he career as a marine engineer working all over the world. About 5 years ago his health deteriorated and he contacted me in the US to offer me it for sale. I bought it and my son collected it and was taken apart as it had been parked for a long time. The engine had been well oiled prior to storage and was rotating nicely. My son shipped the bike over here to NC earlier this year with all his belongings as he finally emigrated here after waiting 10 years to do so! Due to it sitting we took the engine apart and to be safe we took the crankshaft apart to clean out any sludge although it was found to be real good. Recently we put new rod bearings in. Std size. although the ones in place were excellent. High compression pistons (Std. bore) were superb and like new. Cam followers were removed and cleaned. The swinging arm rubber bushes were re-newed and a new Pazon electronic ignition was fitted and timed at 30 degrees BTDC. as recommended. Oil pump was checked and is working great. We also fitted a new top fairing and screen we got from England. We fired the bike up recently and it sounds great. We have a video of the bike running. A CD has been produced that shows the rebuild.